According to Weckstein (1977), storing food in reserves is more of a primitive mind-set, given that the modern transportation revolution have effectively joined most of the grain markets of the world into one. Also, Weckstein points out that most disaster-induced transitory food deficits can be generally off-set by surpluses in other countries. The largest absolute deficit recorded in world food production as of 1977 was in 1972-73, and was only less than 4 percent of world output that year. Weckstein argued that such a small overall deviation in food production can also be countered by a modest decrease in overall consumption. Also, food reserve are rarely efficiently used, as in the case of the 1972-73 disaster when the food prices rose by 400 percent, while a huge stock of grain held in official US reserves remain untouched. Weckstein reasons that food surpluses in grain reserves are not efficiently disposed in the world market because world market is fractured that countries with surpluses view it more advantageous to store their surpluses than to sell them abroad. In essence, Weckstein argues that physical food reserves are inefficient and stiffens the barriers in food trade. As a result, he proposes “an international grain-trade financing institution especially established to facilitate the purchase and sale of grain in relation to abnormal harvests,” which would reduce trade barriers and provide efficient response to disasters. Instead of fixing the IEFR, which requires a renewed global effort, perhaps regionalizing such a food reserve is a more viable alternative. An additional benefit of regional food reserves would be that each region could store staple food that are popular and culturally necessary for themselves, such as rice in Asia and potato in South America. As Timmer (1997) points out, stabilizing the price of a popular staple food is an essential element of food security (p. 5). However, localizing food reserves to individual countries and other localities can have the bad side effects that Weckstein (1977) described. A regional food reserve not owned by any specific nation would be more distant from the producers so that they wouldn't make any inefficient production decisions as a result, and would be more conducive to agricultural trade. The East Asia Emergency Rice Reserve (EAERR), a pilot project among the ten ASEAN member states, China, Japan and South Korea, serves as a good example for such a regional food reserve. To improve farmers’ income and welfare (Daño and Peria, 2006, p. 87). Disaster-induced food deficits in each region will be aided primarily by the corresponding regional food reserves. These reserves consist of both food earmarked by each member nation in respective regions and their voluntary contributions. The food stocks shall be stored at various location in the region to ensure quick response and distribution, both as physical stocks and earmarked surpluses. These reserves will be carefully monitored and administrated by a board of representatives from each nation in the region, so as to ensure that 1) the reserve is only used when a significant short-term food deficit arises in the region that cannot be resolved easily from trade; 2) and that the reserve will be used and replenished without any repurcussion on regional food trades. All nations will have one vote on the board to ensure equal standing of poorer countries in that region. Each of the regional food reserves will be established and maintained at the expense of nations in respective regions. WFP shall 1) transfer its existing IEFR reserve to respective regional reserves; 2) assist the establishment of each regional reserves by providing guidelines. The proposal for regional food reserves can be discussed at the next UN assembly as a modification to the existing WFP programs. Each region can then start the construction of the reserve around 2012. The full establishment of the reserves should be complete by 2015.Food reserves appear to be a natural solution for relief of agricultural disasters and stabilization of food prices. Nonetheless, there are many unfavorable side effects with food reserves. Daño, E., & Peria, E. (2006). Emergency or expediency? 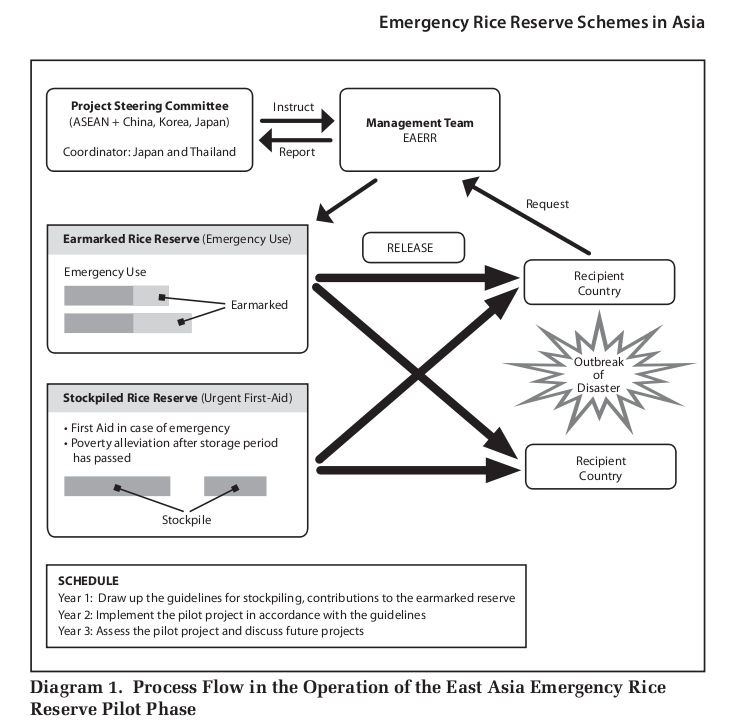 A study of emergency rice reserve schemes in Asia. Initiatives on pro-small farmer trade (pp. 77-95). Manila, Philippines: AFA and AsiaDHRRA. Shaw, D. J. (2007). World food security: a history since 1945. New York: Palgrave Macmillan. Timmer, C. P. (1997). Food Security Strategies: The Asian Experience. Rome, Italy: Food and Agriculture Organization of the United Nations. Weckstein, R. S. (1977). Grain Bank or Grain Reserve. Intereconomics, 12(1-2), 15-18.